Four Countries cycle challenge quilt raffle. 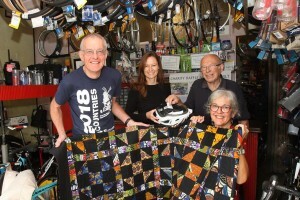 In August 2018 Margaret and Tom Winskill took part in our Four Countries cycle challenge from Canterbury to Amsterdam. They paid their own ride costs but found an unusual way to raise additional funds for us. They raffled a bespoke quilt that had been hand made by a friend, from traditional Zambian chitenge material. The raffle raised an incredible £1700!! We asked our local bike man, Trevor Page (see photo), to draw the winning tickets. We are delighted to say that the quilt is now with its new owner, Douglas who is a very happy man. The second and third prizes went to Erica from Shepton Mallett, and Gail from Corsham. Thank you, Margaret and Tom, for supporting us over the years, and for coming up with such unique fundraising ideas!